Three people in a car with Uber and Lyft stickers on it were injured early Friday in San Jose when they were involved in some sort of crash and hit-and-run near an elementary school. Sgt. 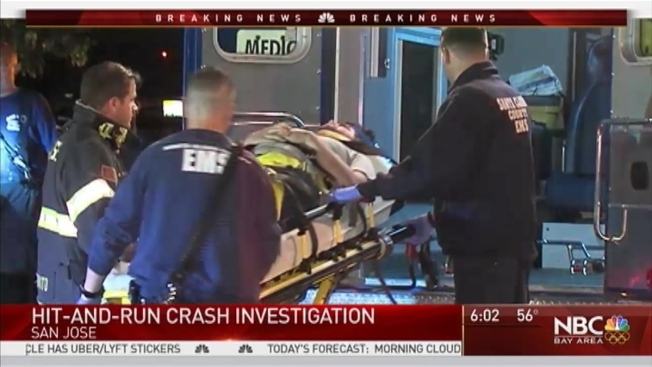 Brent McKim said three men in the first car suffered injuries and were taken to the hospital after officers were called out at 2 a.m. at the intersection of Old Almaden Road and Capitol Expressway. When they got there, they found the car severely damaged and learned that a second, blue car had been involved. That car was found about a mile and half away near Carson Elementary School, McKim said. Inside was the driver, who appeared to be in his 20s. McKim said he will likely be booked when he is medically cleared.